On the roof of April and Casey’s apartment, Mike looks sullenly at the street below. Don finishes his investigation and determines that Shadow was never on the roof, assuring Mikey that she wasn’t playing up there. Raph comes back and says there’s no sign of Shadow in a five block radius. He begins to chide Mike for his poor babysitting skills, but Mike isn’t in the mood. Suddenly, Leo appears and says he’s found something. Leo leads them to the box of Charlie, a hobo, who has been killed with a sai. They determine that Shadow was kidnapped and Charlie, unfortunately, was in the wrong place at the wrong time. The sai indicates ninja-involvement, but they decide it can’t be the Kunoichi seeking vengeance, as Lord Komodo packed up and went to Taiwan after his castle blew up. That just leaves the Foot Clan. Raph refuses to accept the verdict, as ever since their truce, he’s become friends with several members of the Foot and has even gone on missions with them. Raph rushes to a secret Foot base to get some answers. Arriving at the base (an old abandoned warehouse), he is greeted by several Foot Soldiers. Rather than fight, he politely requests an audience with their council. Back at April and Casey’s place, April is still outside talking to the police. The Turtles decide to go in through the back, only to find an enraged Casey hurling all of Mike’s property out the door. Casey attacks Leo (mistaking him for Mike), blaming him for the disappearance of his daughter. Don pulls him back and Casey breaks down crying. He begins to throw them all out, but then April arrives and tells them not to go. She attempts to calm Casey down, but Casey is too distraught. He accuses April of being jealous of Shadow, as she was Gabrielle’s daughter and not her own, then storms out. April, crying, tells the Turtles that Casey had too much to drink at the party and didn’t mean any of the things he said. At the warehouse, Raph is discussing matters with the Foot council. He asks if the Foot were involved with Shadow’s kidnapping and the head member of the council admits that they were (albeit unaware that Shadow was the daughter of a friend of theirs). Raph says that this is a breach of their truce and threatens to go straight to Karai. The council head says that there has been conflict between the New York and Japanese branches of the Foot Clan and that Karai has not been seen in weeks, presumed dead. The Foot council does make Raph an offer, though: if he kills a selected target for them, they will tell him where Shadow is. Back at the apartment, the Turtles are trying to cheer April up. She regrets that she hasn’t been the “den mother” of the gang ever since she ran away to Los Angeles. She begins to wonder whether Casey even loves her anymore, or at least as much as he loved Gabrielle. The Foot Soldiers lead Raph to the penthouse home of mobster Antoine ‘Big Tony’ Puzoreli and inform him that the man inside is his target. The Foot will only be acting as observers and Raph must perform the assassination on his own. Raph swings in through the living room window by rope and sneaks over to Puzoreli’s bedroom, narrowly avoiding being spotted by some blonde chick. He sneaks right up to Puzoreli and contemplates how much good he’ll be doing by killing such a tremendous scumbag. Honor eventually overcomes him and he backs down, vowing to find Shadow another way. About to leave, the lights come on and Raph spots the blonde chick… with Shadow? Suddenly, several guards kick the door in and open fire. Raph escapes through the window and begins climbing the rope. One of the Foot Soldiers tells him that he’s failed his mission and must now pay the penalty. The Foot Soldier then cuts the rope and sends Raph falling down the side of the skyscraper. *This issue is continued from TMNT (Vol. 3) #6. The story continues in TMNT (Vol. 3) #8. 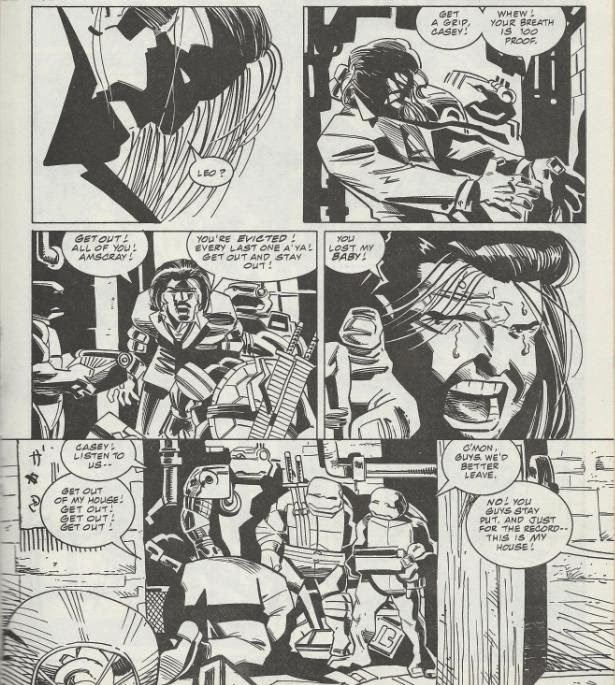 *The Turtles fought the Kunoichi and destroyed Dragonlord Komodo’s castle in TMNT (Vol. 3) #5. 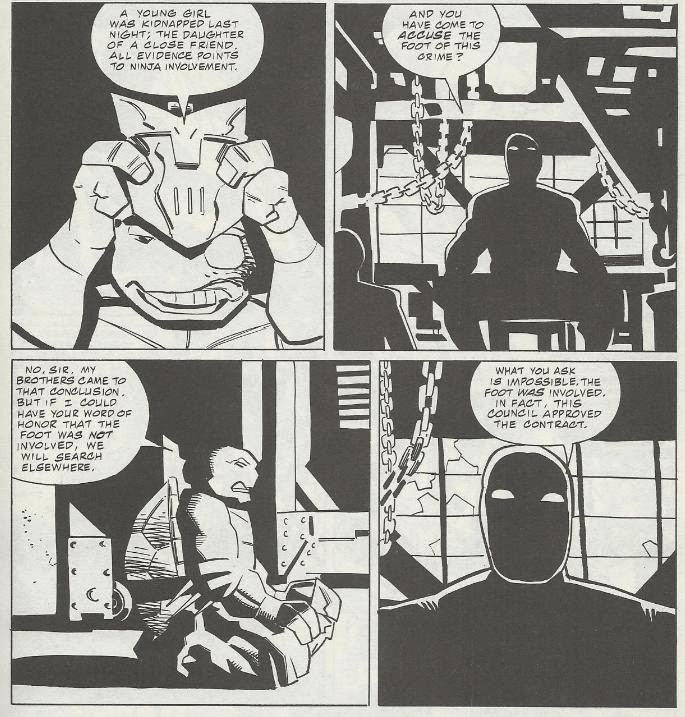 *The Turtles pact with the Foot Clan happened in TMNT (Vol. 1) #61. 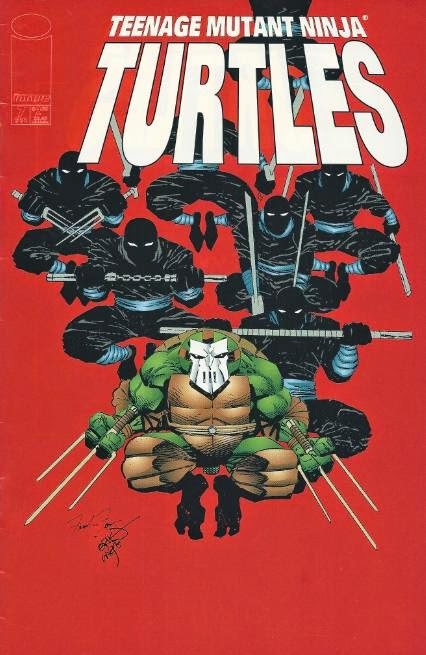 Raph was first shown to have contacts within the Foot in TMNT (Vol. 3) #2. *Chronologically, Karai last appeared in Tales of the TMNT (Vol. 2) #43. The nature of her dishonor and missing status will be revealed in TMNT (Vol. 3) #25. 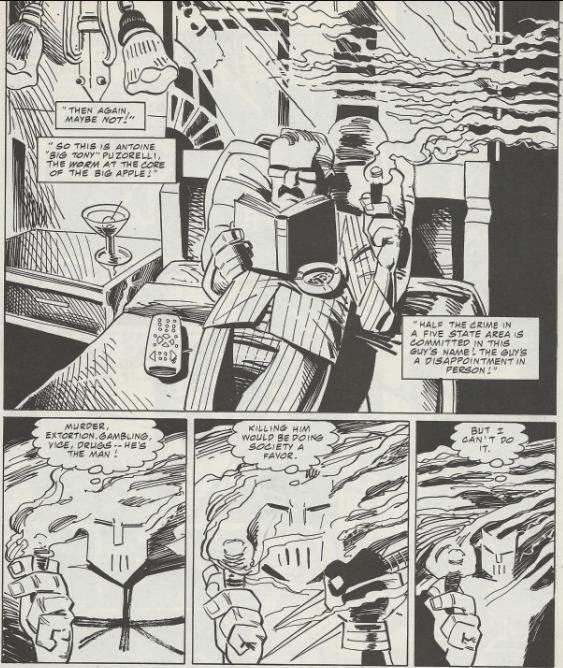 *Casey was first shown struggling with a drinking problem in TMNT (Vol. 1) #49. *April ran away to Los Angeles in TMNT (Vol. 1) #50. And so we segue into Volume 3’s next arc, the all-too-brief kidnapping of Shadow. This was an arc I really enjoyed, as it centered on the more human side of the Turtles (them actually having *gasp* emotional bonds with those that they love!) and dealt with a lot of inner turmoil, particularly between Casey and April. Though seeing Casey relapse back into his alcoholism was a bit disappointing, since the whole point of his arc during “City at War” was to see him recover from his downward spiral, I imagine that the kidnapping of your child would be good enough incentive for a relapse. April trying to cope with the fact that she abandoned the Turtles during “City at War” and doesn’t feel as closely connected to Shadow as Casey does was a nice touch, though marred by some more awkward info-dumping. What this arc really initiated, though, was perhaps my favorite ongoing plot line of the Image series: Raph and the Foot Clan. While the initial Dragonlord Komodo arc felt like a trite superhero vs. super villain story, this arc really digs into the whole ninja aspect of the series which I adore above all else. Raph making friends among the Foot Clan during their truce felt like a pretty natural thing for him to do and his interactions with them will only proceed to get better. And I gotta say it again: I really love seeing Raph with that hockey mask on. If there’s any element that sort of bugged me, it’s that once again the New York and Japanese branches of the Foot Clan are going through a power struggle. It sort of makes the primary plot line of “City at War” feel a bit wasted, as everything they worked so hard to resolve was undone off-panel. Granted, it’s been two volumes since Karai reunited the branches, so that’s plenty of time for things to fall apart again (especially if Karai is missing). Anyhow, this second arc of Volume 3 almost feels like a completely different comic from the first one and all the better for it. Carlson’s really getting comfortable with the characters, showing their deeper emotional connections with the people around them, rather than having them run around like shallow cartoon characters. The very first issue of Volume 3 that I ever bought and read! Certainly a classic in my book! But something about the cover bugs me. Is it just me or is the awesome image cropped too highly on the page? The top foot soldier gets cut out of the picture and there is so much empty space at the bottom.